Ludovic Travers, still in the army, is obliged to combine his military duties with being an invaluable private sleuth on behalf of Scotland Yard. Now Inspector Wharton has asked Ludo to track down a man in a village rife with blackmail and skulduggery. A problem soon arises however—murder, and that of the very man Travers was sent to find. Travers eventually faces a moral quandary about what to conceal and what to reveal about his discoveries—which could lead to someone’s execution. This classic English village murder mystery involves a large number of suspects, and a breathtaking series of twists, some if not all involving the Chief Constable’s wife—the novel’s “platinum blonde”. 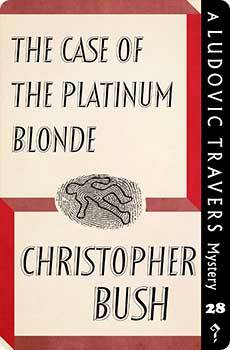 The Case of the Platinum Blonde was originally published in 1944. This new edition features an introduction by crime fiction historian Curtis Evans.